A quick and easy recipe for seasonally-inspired cupcakes using homemade cake mix. I don’t really get excited about the pumpkin spice latte. I’m more about the other seasonal drinks that certain coffee shop sells. I got hooked on coffee drinking mochas, but unlike my husband, mochas aren’t my drink anymore. Still, every winter I have to get at least one peppermint mocha. Mint and chocolate is a classic holiday combination, and who doesn’t like that kick of caffeine? Today I’ve taken that seasonal peppermint mocha concept and applied it to cupcakes. 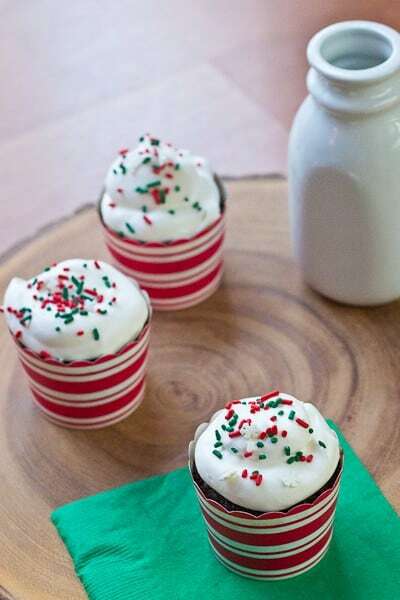 These peppermint mocha cupcakes have chocolate, peppermint and coffee in the cake itself and are even topped with a dollop of whipped cream. They are inspired by a coffee shop drink, after all! Thanks to having a batch of Homemade Devil’s Food Cake Mix in the freezer, these came together on a whim. 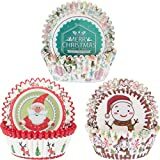 That whim being finding super cute cupcake papers when I was doing some Christmas shopping. You really never know where inspiration will strike, after all, so better to be prepared with homemade cake mix in the freezer. 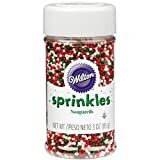 To give these cupcakes their peppermint mocha flavor, I simply swapped in strong brewed coffee for the water I would normally use when baking with the cake mix and added a splash of peppermint extract. You’ll notice that this recipe only calls for 1/4 teaspoon peppermint extract. I find peppermint extract to be extremely potent, so be careful with your pour, otherwise your cupcakes might taste a bit medicinal instead of getting that pleasant, refreshing rush. pure peppermint extract will help with this as well — you want a true peppermint flavor, none of that artificial stuff here. Today these cupcakes are out brightening the day of my husband’s coworkers. I mean, really. Who doesn’t like chocolate, whipped cream, and sprinkles? If you want to brighten someone’s day with some peppermint mocha flavor, I’ve got you covered with an assortment of delicious peppermint mocha dessert recipes. Who says donuts can’t be dessert? Peppermint mocha donuts are as pretty as they are delicious and serve double-duty as breakfast or dessert. There are few things prettier than a striped meringue cookie. Add a bit of coffee extract to the melted chocolate to give these chocolate-dipped peppermint meringue cookies a bit of mocha flavor. Homemade marshmallows are decadent and delicious. Peppermint mocha boozy marshmallows would be delicious in an upscale s’more or simply dropped into a cup of hot chocolate. Peppermint mocha brownie cookies are a fun way to dress up a box of brownie mix. They’re easy to make, but no one would ever guess they started from a mix! Get double the peppermint mocha flavor from spiked peppermint mocha hot chocolate. The blast of peppermint and coffee is in both the hot chocolate and in the whipped cream! 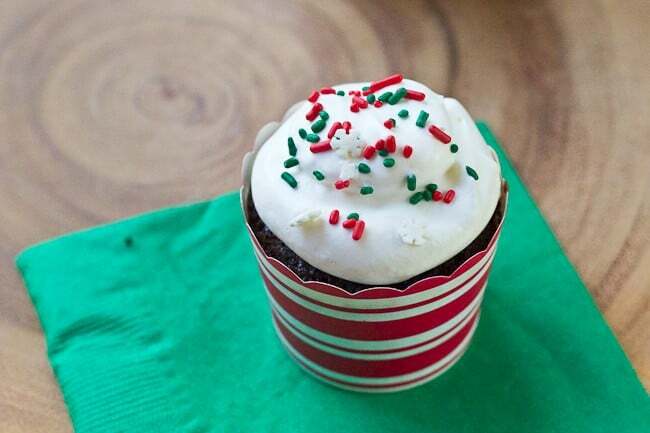 A quick and easy recipe for seasonally-inspired peppermint mocha cupcakes using homemade cake mix. Preheat oven to 350°F and line a cupcake tin with paper liners. Mix together cake mix, coffee, eggs, and extract together until well-incorporated, breaking up large lumps if needed. Pour about 1/4 cup batter into each cupcake paper. Beat heavy whipping cream until soft peaks form. Add sugar and vanilla and continue whipping until thickened and almost to stiff peaks. If using a mixer, finish whipping by hand for a smoother result. Dollop whipped cream on each cupcake and top with sprinkles, if desired. Outstanding looking cupcakes. So festive and fun! When I originally commented I clicked the -Notify me when new feedback are added- checkbox and now every time a comment is added I get four emails with the same comment. Is there any means you’ll be able to take away me from that service? Thanks!